in Woburn, September 5th, at ninety one years of age. Beloved wife of the late Paul V. Bertochi. Devoted mother of Paul G. Bertochi, his wife Sherry of Tyngsboro, Thomas Bertochi, his wife Sarah of Marlborough, David Bertochi, his wife Margaret of Winchester and Linda Cleveland, her husband Steven of Billerica. Dear sister of the late Henry, Lawrence and Robert McLaughlin. Sister in law of Margaret O’Connor of Framingham, Mary McLaughlin of Woburn, Maureen McLaughlin of Burlington and the late Helen McLaughlin. Cherished Nana of Cristine Seitz, her husband Jonathan of Dedham, Michael Bertochi, his wife Briana of No. Falmouth, Leanne Gerhart, her husband Kyle of So. Boston, Timothy Bertochi of Medford, Peter Bertochi of Boylston, Daniel Bertochi and Matthew Bertochi of Marlborough and Adam and Derek Cleveland of Billerica. Also survived by many loving nieces, nephews and cousins. A Funeral will be held from the Lynch-Cantillon Funeral Home, 263 Main Street, Woburn, Thursday, September 13th at 9:00 a.m. followed by a Mass to be Celebrated in St. Barbara’s Church, 138 Cambridge Road, Woburn at 10 a.m. Interment in Woodbrook Cemetery. Family and friends are respectfully invited to calling hours at the Funeral Home, Wednesday 3-7 p.m. Remembrances may be made in Kathleen’s honor to the American Heart Assoc., 300 5th Ave, Waltham, MA 02451. For directions or to leave an online condolence, please visit www.lynch-cantillon.com or Facebook under Lynch-Cantillon Funeral Home. 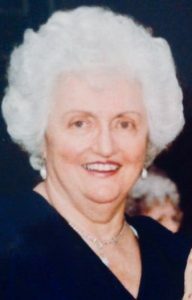 Kathleen T. (McLaughlin) Bertochi passed away Wednesday, September 5th. The beloved wife of the late Paul V. Bertoch, who passed away in March of this year, was ninety one years of age. Born in East Boston, she was the daughter of the late Henry and Catherine (Maguire) McLaughlin. One of four children, they were raised and educated in Medford, where Kathleen was a graduate of Medford High School, with the Class of 1946. Kathleen was introduced to a gentleman named Paul Bertochi, while at the home of a dear friend learning how to cook spaghetti and sauce! Well, that was the beginning of a life long relationship, with sixty one years of marriage, four children and nine beautiful grandchildren. After their marriage they moved to Woburn, where they made their home and raised their family for over sixty one years. Kathleen was very active with her children all throughout life. From the time they were small, through all their academic, sporting and social events, to seeing all of her grandchildren and their special events she was there. When the grandchildren would come to visit, they were all off to Chuckie Cheese , which was their favorite spot for an” any day” celebration. When the children were grown Kathleen found her perfect job, Hostess in the Executive Dining Room at NE Life Insurance. Being a vivacious, happy go lucky, and interesting person, Kathleen was right at home in this position, which she held for almost a decade. Family was her life. Holidays were the absolute best. A time to celebrate with family and loved ones and always enjoying the seasons. Paul and she were able to enjoy travelling to England to revisit where he was during the service. Over the years from the time the children were small and throughout they years frequented destinations in New Hampshire at Alton Bay , White Mountains and Cape Cod. Sadly, Kathleen was predeceased by her husband Paul, who passed away in March of this year , her parents, and her siblings Henry, Robert and Lawrence McLaughlin and his wife Helen. She is lovingly survived by her dear children Paul G. Bertochi, his wife Sherry of Tyngsboro, Thomas Bertochi, his wife Sarah of Marlborough, David Bertochi, his wife Margaret of Winchester and Linda Cleveland, her husband Steven of Billerica. Dear sister of the late Henry, Lawrence and Robert McLaughlin. Sister in law of Margaret O’Connor of Framingham, Mary McLaughlin of Woburn, Maureen McLaughlin of Burlington. Cherished Nana of Cristine Seitz, her husband Jonathan of Dedham, Michael Bertochi, his wife Briana of No. Falmouth, Leanne Gerhart, her husband Kyle of So. Boston, Timothy Bertochi of Medford, Peter Bertochi of Boylston, Daniel Bertochi and Matthew Bertochi of Marlborough and Adam and Derek Cleveland of Billerica. Also survived by many loving nieces, nephews and cousins. A Funeral will be held from the Lynch-Cantillon Funeral Home, 263 Main Street, Woburn, Thursday, September 13th at 9:00 a.m. followed by a Mass to be Celebrated in St. Barbara’s Church, 138 Cambridge Road, Woburn at 10 a.m. Interment in Woodbrook Cemetery. Family and friends are respectfully invited to calling hours at the Funeral Home, Wednesday 3-7 p.m. Remembrances may be made in Kathleen’s honor to the American Heart Assoc., 300 5th Ave, Waltham, MA 02451. For directions or to leave an online condolence, please visit www.lynch-cantillon.com or Facebook under Lynch-Cantillon Funeral Home. A Funeral will be held from the Lynch-Cantillon Funeral Home, 263 Main Street, Woburn, Thursday, September 13th at 9:00 a.m. followed by a Mass to be Celebrated in St. Barbara’s Church, 138 Cambridge Road, Woburn at 10 a.m. Interment in Woodbrook Cemetery. Family and friends are respectfully invited to calling hours at the Funeral Home, Wednesday 3-7 p.m. Remembrances may be made in Kathleen’s honor to the American Heart Assoc., 300 5th Ave, Waltham, MA 02451. For directions or to leave an online condolence, please visit www.lynch-cantillon.com or Facebook under Lynch-Cantillon Funeral Home. So sorry for your loss. Kay was such a beautiful person. The short time that we worked together, there was always something every day for us to laugh about. Once she started laughing, you couldn’t help but laugh yourself. Love you Kay. Bertochi Family: Sorry for your loss. You all are in our thoughts and prayers at this difficult time.